Christopher Mayo is a composer of “poignant” and “persuasive” music (The Independent), whose “attractive and intelligent compositional voice” (Musicworks Magazine) has brought him recognition not only in his native Canada, but also across Europe and the United States. Mayo was the 2012-13 Sound and Music 'Embedded' Composer in Residence with the Manchester Camerata for whom he composed three new works. Finding inspiration in diverse and eclectic sources, Mayo's music has been called "robust, lively, witty, colourful but never light" (Radio Canada). Mayo’s Death on Three-Mile Creek, premiered at Carnegie Hall in 2011, “resourcefully evoked Appalachian folk styles, New Orleans funeral marches and the shifting pulses of drum 'n' bass electronica in setting aphoristic eulogies by Jonathan Williams” (The New York Times). Also in 2011, The New York Times described Mayo’s MATA Festival commission Of Trees & Fields & Men as “lovely”, while the New Jersey Star-Ledger said the work “captivated with a shifting kaleidoscope of sound worlds”. In 2012 Mayo’s work The Window, written for Rambert Dance Company, was cited as “thematically ambitious and sophisticatedly realised” by The Stage. Further recent commissions have included the London Symphony Orchestra, English National Ballet, the National Youth Orchestra of Great Britain, Marrakech Biennale, Vancouver Symphony Orchestra, Ensemble contemporain de Montréal + and Aldeburgh Young Musicians. Mayo’s music has been performed by orchestras and ensembles such as the London Symphony Orchestra, the BBC Symphony Orchestra, the BBC National Orchestra of Wales, the London Sinfonietta, ACME, the Nouvel Ensemble Moderne, the Esprit Orchestra and Aventa and by performers including Michael Collins, Huw Watkins, Oliver Coates and Danny Driver. Festivals which have featured Mayo’s music include the Cheltenham Festival, the Aldeburgh Festival, Faster than Sound and the Bang on a Can Summer Music Festival. Mayo has collaborated with a range of artists including Matthew Herbert on his One Day project for the London Sinfonietta and Turner Prize-nominated artist Spartacus Chetwynd on a performance art piece for the Gasworks Gallery. Mayo also appeared in the BBC 2 television documentary Classic Goldie where he assisted English drum and bass star Goldie on a commission for the BBC Proms. Born in Toronto in 1980, and currently living in London UK, Mayo holds a Master’s degree from the Royal College of Music, where he studied with Julian Anderson and a PhD from the Royal Academy of Music, where he studied with Philip Cashian. 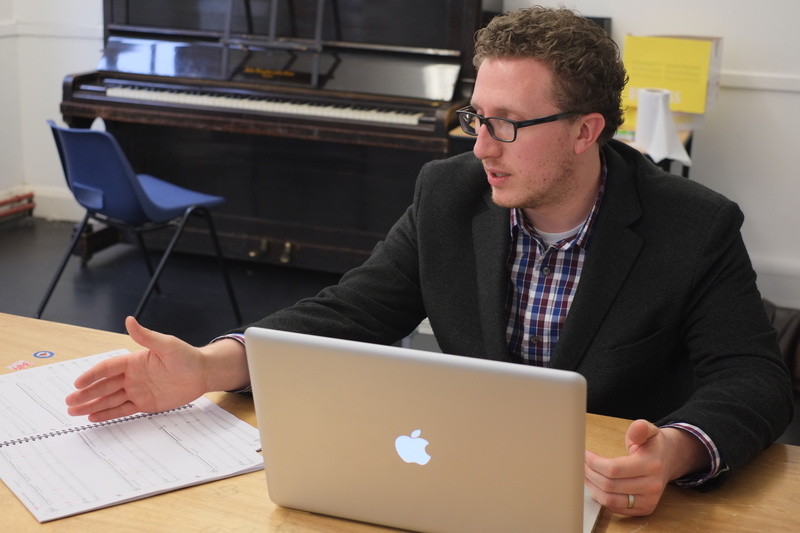 He is currently Teaching Fellow in Composition at Royal Holloway, University of London. Mayo is a winner of a SOCAN Award for Young Composers and the Royal Philharmonic Society Composition Prize.